Squash is such a fun word to say! It is ridiculously cheap, especially when it is in season. You can buy squash, set it on your counter/in your pantry and forget about it for months. It will still be good. It is one of the easiest vegetables to grow yourself. It can be prepared as a vegetable, like a potato, or even as Lasagna Noodles. And finally, because I love squash soup! Chop your butternut squash into pieces (it doesn’t matter how large) and scoop out inards. Place in large pot with 1 inch of water in bottom and cook on high heat. This is to soften the squash’s tough skin. It makes it much easier to peel. Cube potato and dice 1/2 Apple. 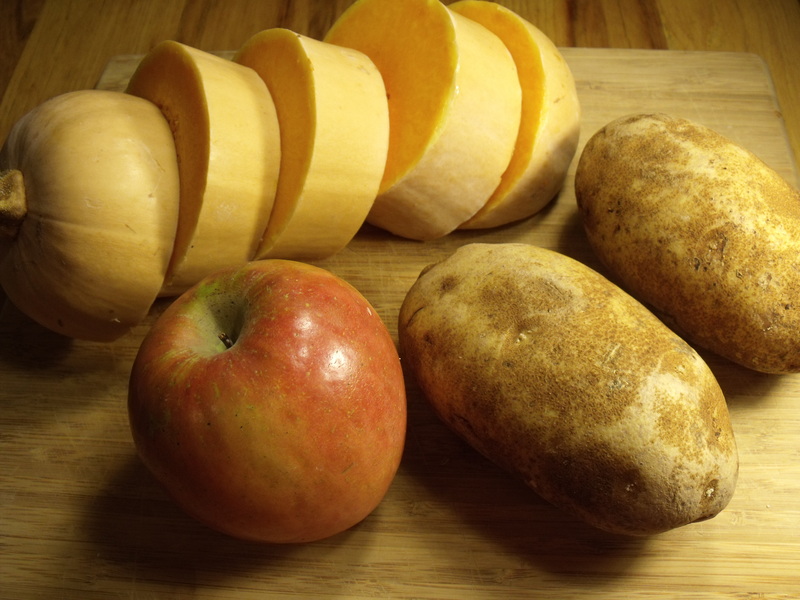 You can peel the potatoes and apple, but we kept the peel on to retain more of the nutrients and delicious flavor. Remove Squash from pot once skin has softened, but do not drain the water. This will be used again since it has some of the squash flavor and nutrients. Peel and cut squash into large cubes. 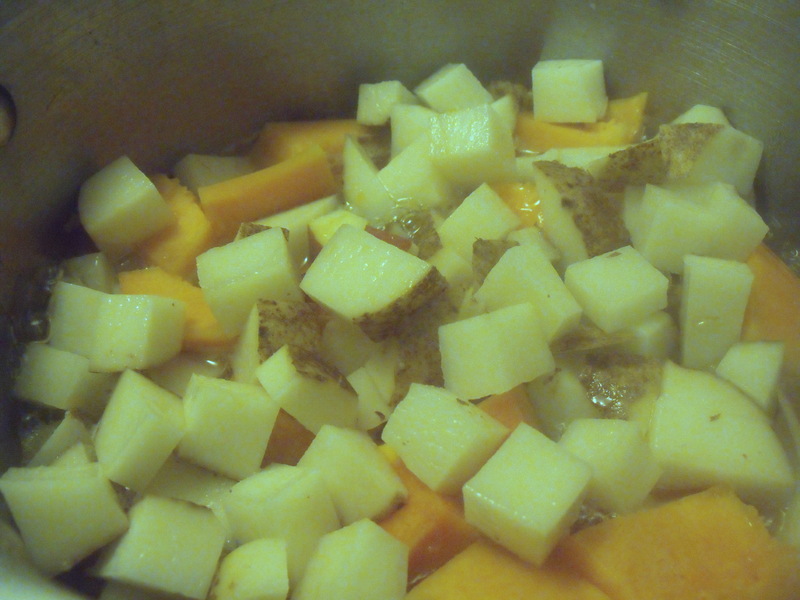 Then add Squash, Potatoes and Apple to the same large pot and cook on high. Cut Cauliflower and Carrots into small, bite sized pieces. Secret: I used the leftover, already cut cauliflower and carrots from Stir Fry night. 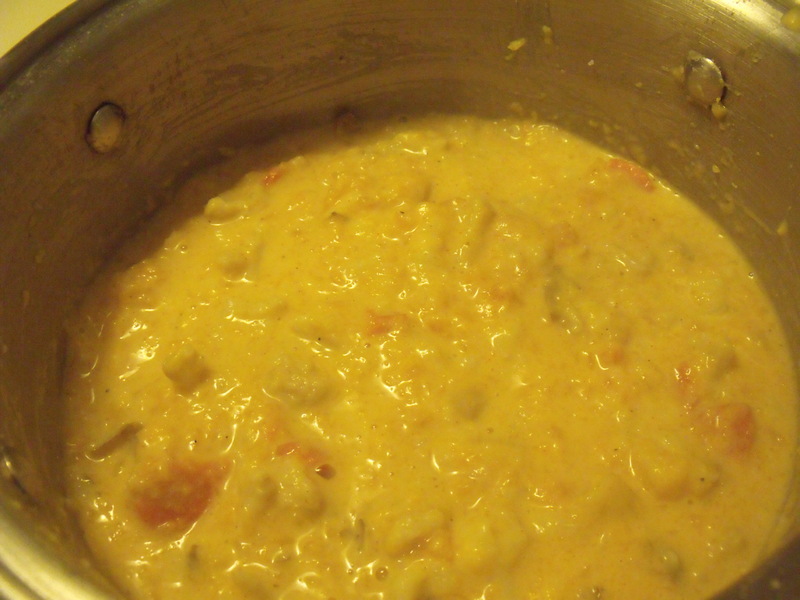 Once squash is as soft, pour Heavy Cream and about 1/4 Cup of Milk into pot. Begin to mash squash, potatoes, apples, milk and cream together. It doesn’t have to be perfectly even. Add more milk if you prefer thinner soup. Once the soup base is the consistency that you want it to be, add in carrots and cauliflower. Turn the stove burner down to Medium heat. Add in spices. 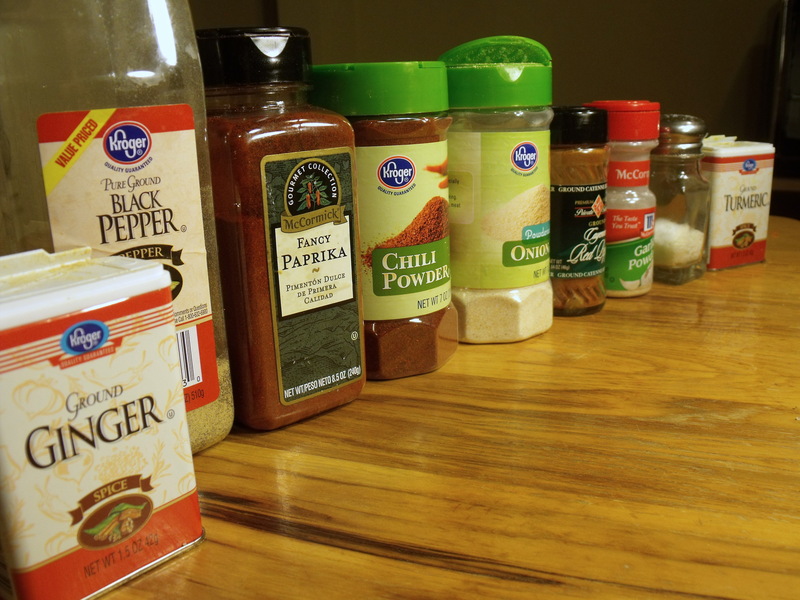 The paprika, garlic, and ginger should be the base spices. We like to add black pepper, onion powder and some tumeric for more depth of flavor, and some cayenne pepper for a little zing. 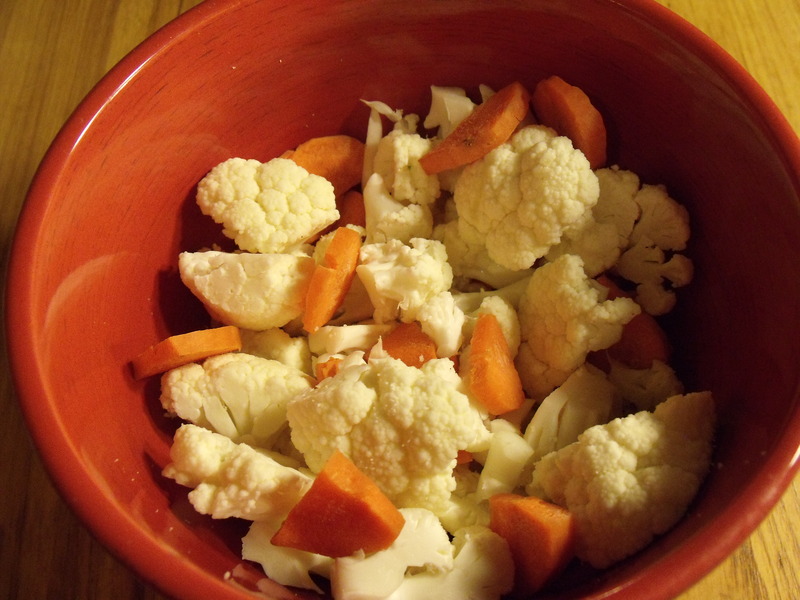 Allow soup to cook until carrots and cauliflower are soft. Step 3: Taste and Know that the Lord is Good. Ladle yourself a bowl of this deliciousness. I use a big bowl to match the size of my love for food. Add Feta chesse. Everything is betta with Feta. Add more cayenne pepper and more apple. These act as opposites in this recipe, one bringing sweetness and one bringing spiciness. If you want it to be more or less spicy, change the ratio. If you want a more intense flavor, increase both. Skip the potato. Adding more squash and no potato makes the flavor of the soup a bit more intense. If you like more flavor or just love squash, it is defiantly worth a try. Try different apples. Until this time, I had always used Granny Smith Apples, because the sour adds another dimension of flavor. We didn’t have any in the house, so I tried a different type of apple and it was well worth it. Experiment and let us know what works! I so enjoy the reasons you love squash. Especially numbers 1 and 4. 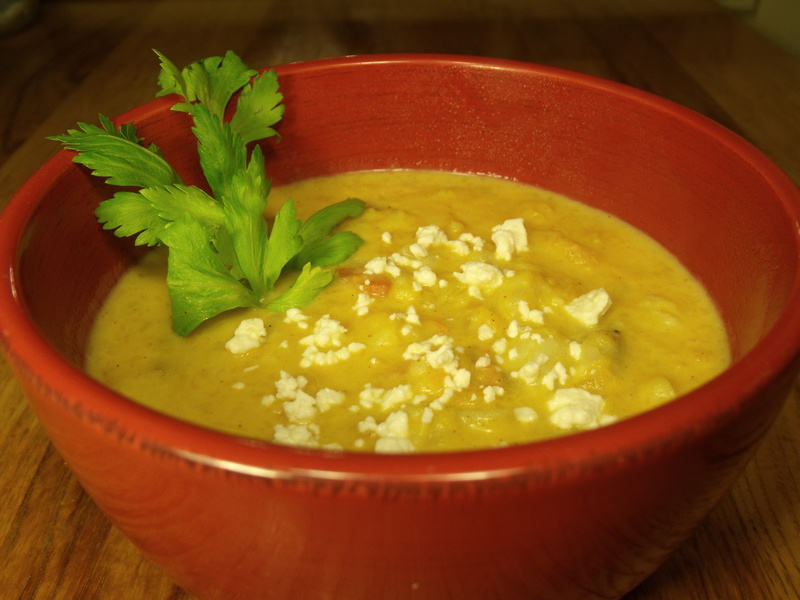 Butternut squash soup is one of my favorite dishes! I don’t think I’ve ever tasted a bad version whether homemade or from a box. I’ll have to give your recipe a try!